In a call-out to a smelter in South Africa last week, the IDX Product Technical Support Team assisted in the configuration of an Anybus X gateway. This particular flavour of the vast Anybus range converts PROFIBUS to ControlNet. More specifically, it is a PROFIBUS master and a ControlNet adapter (slave). In this case, the PROFIBUS slaves were analyzers used to monitor gas emissions into the atmosphere. However, the plant's main control system runs off an Allen Bradley PLC and speaks ControlNet. 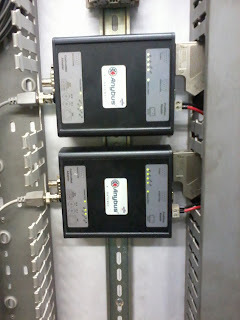 The X gateway was configured to read the data from the PROFIBUS analyzers and convert these values to ControlNet. This allows the control system to monitor the plant's emissions demonstrating once again the critical role that the Anybus Product range plays in industry. So what steps were taken to ensure everything was working? 2) It was ensured that the PROFIBUS network was healthy. This was of course done using our trusty ProfiTrace. We checked the live list, the waveforms and statistics and very quickly determined that a termination switch had been left off! The result of this was that one of the PROFIBUS slaves was falling in and out of communication. The termination was corrected, and reports were generated by ProfiTrace to show the client that the PROFIBUS side was healthy. 3) The really quick part is connecting to the gateway via serial and configuring how much IO was to be mapped from the PROFIBUS side to the ControlNet side. By the way, ProfiTrace can be used to sniff the messages and see what the IO sizes are if you were not the person doing the PROFIBUS setup. 4) The ControlNet PLC was configured (the application note on how to configure RSNetWorx under the Anybus Site came in handy here) to read from these two nodes and just like magic, we could see data coming through! I am sure, you'll find the solution to your protocol conversion needs here!